WHAT DO PEOPLE WITH INJURY (Such as auto accidents, paralysis, etc.) OR DISEASE Such as Diabetes, Cerebral Palsy HAVE IN COMMON? ANSWER: Reduced activity leading to DISUSE ATROPHY. 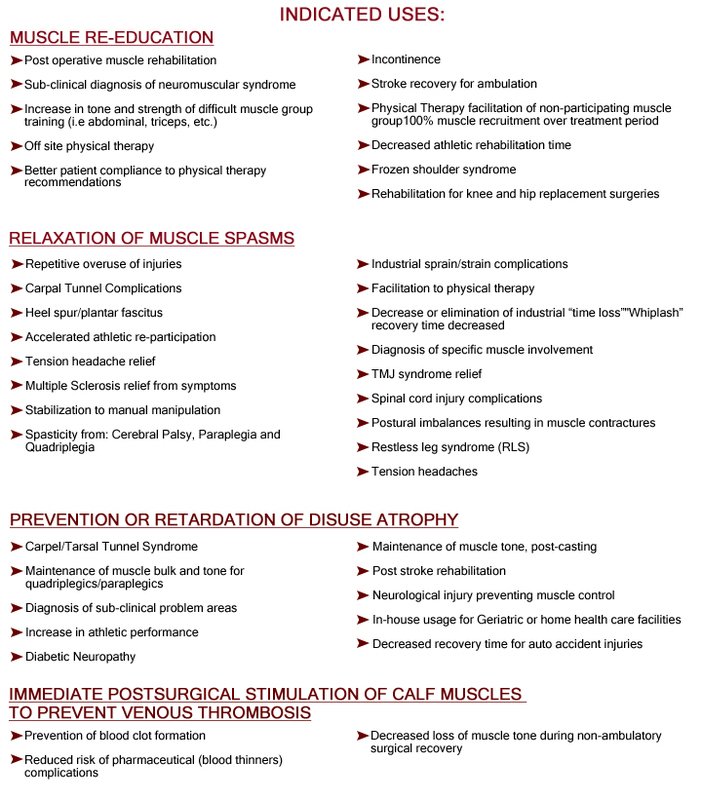 Imbalance of muscles leading to MUSCLE SPASMS. 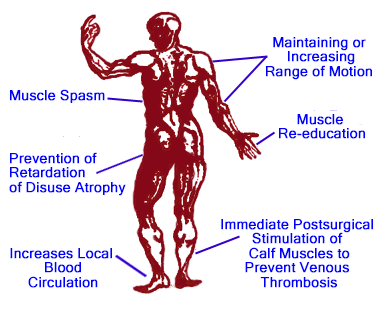 Reduced circulation leading to the need for INCREASE LOCAL BLOOD CIRCULATION. Reduced range of motion in the joints due to inflammation or trauma needing INCREASE RANGE OF MOTION. In these cases the Neurocare™ can be very effective at maintaining or reversing many of the unpleasant symptoms. Neurocare™ simulates exercise but achieves results by working the inactive or injured muscle fibers versus a “fast twitch” on the active muscle, thus strengthening and re-educating the specific injured or atrophied muscle. As in exercise this also increases local blood circulation and re-educates weak muscles or muscles in spasm. Treatments are provided under your physician’s prescription but done in your home. If the treatments are needed due to an injury, normal work activities can usually be maintained during the recovery period. Most all persons who have had an injury or compromised circulation problems will experience one or more of these symptoms due to their problem.